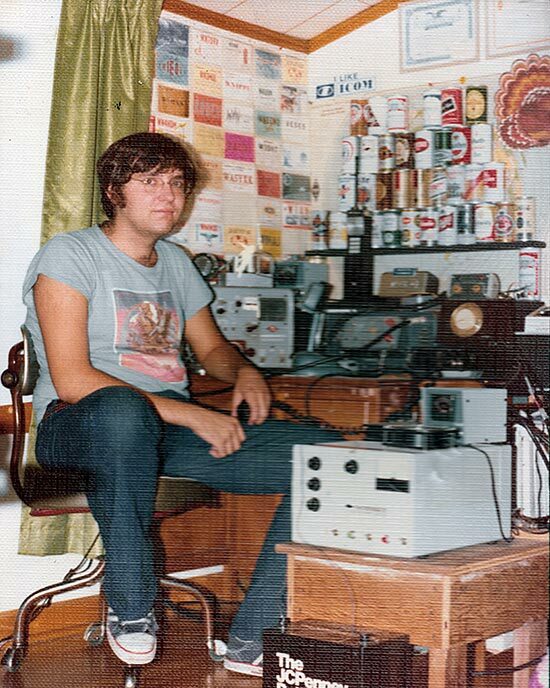 Cleaning the garage, I found this photo of me in my radio shack in 1978. It was strictly a VHF and UHF operation back then. On the desk was a Gonset Communicator 2-meter AM transceiver (that I have no recollection of owning! ), a Motorola UHF commercial transceiver converted for 450 MHz FM and an ICOM IC-230 2-meter FM mobile transceiver (under the antenna rotor control box). On the shelf was a Wilson 2-meter handheld that was responsible for kicking off my ham radio writing career. I added the Touch-Tone pad to the Wilson and wrote a how-to article that Wayne Green, W2NSD, published in 73 Magazine. Next to my knee was a Gonset 2-meter 500-watt amplifier. My fledgling beer can collection was on the shelf behind the Wilson.